The new policy closes the catch and release loophole by detaining the parents while their children are placed in safe homes by the Department of Health and Human Services. This means the parents can be detained for longer than the 20-day limit set by the 1997 Flores decision, so allowing time for the deportation legal process to be completed. The policy does not apply to people who formally ask border agents for asylum, such as the people in the so-called “caravan.” The asylum seekers will not be separated from their children while officials weigh their request to file for asylum. If you cross this border unlawfully, then we will prosecute you. It’s that simple…. If you are smuggling a child, then we will prosecute you and that child will be separated from you as required by law. If you don’t like that, then don’t smuggle children over our border. “It is a gross injustice that DOJ and DHS intend to deny humanitarian protection to people arriving at our borders through a systematic plan to separate families and prosecute all ‘suspected border-crossers,'” complained the American Immigration Lawyers Association. But Sessions and other government officials still face tough obstacles as they try to close the Flores loophole. The opposition comes from pro-migration Democrats and Republicans in Congress, and a lack of DHHS-overseen temporary homes for the children of illegal migrants. The opposition is expected to show itself Tuesday afternoon, May 8, when the Secretary of the Department of Homeland Security, Kirstjen Nielsen, will be questioned by the pro-migration Senators on the Senate’s homeland security appropriations panel. In the March omnibus bill, GOP and Democratic leaders refused President Donald Trump’s request to increase funding for the detention of adults or construction of a border wall. Sessions’ strategy for closing the Flores loophole follows his May 2 announcement that he is sending more judges to the border to quickly process asylum requests, and is adding 35 prosecutors to quickly process deportation cases. 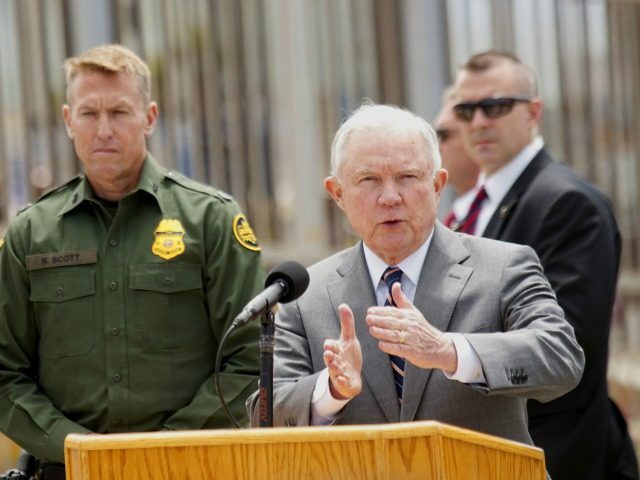 Sessions has also announced a “zero tolerance” policy and promised to prosecute all border-crossers instead of just sending them back over the border. This policy change means that repeat border-crossers will face up to a year in jail — so denying them the ability to repay their debts to the cartels which move people to jobs in the United States. People are not going to “caravan” or otherwise stampede our border. We need legality and integrity in the system. People should wait their turn, ask to apply lawfully before they enter our country. So we’re sending a message worldwide: Don’t come illegally. Make your claim to enter America in the lawful way and wait your turn.